As Christian parents, we want our children to develop a love for Christ and know that the stories in His Word are true and still meaningful today. So, how do you foster a love of God’s word in your children? How do you encourage them to appreciate the Bible, make it applicable to real life, and continue to read it as they grow older? Start when they are young! Make the Bible come alive to them as you share stories that capture their imaginations and teach them about the character of God. Kids love to interact with books and the stories they tell. However, in this time of digital, interactive, and animated content, children expect to be entertained more than ever before. Providing a way for them to learn more about God without staring at a screen of some kind is becoming much harder to do – but it is not impossible. Below are some ways you can make learning about the Bible fun without the help of tablets, TV, or any other type of screen. Find books that encourage your little ones to act out the stories you are telling. Watching them as they pretend to walk on water or pretend to see for the first time will be fun for you and for them. As you read through a book with your child, think about ways you can put the lessons learned into practice. Some examples would be taking dinner to a sick friend, cleaning up the neighbor’s yard, or sponsoring a child who needs help. Plan together and help others! – Be creative and come up with ideas of your own! Find books that have creative formats that will engage your kids. And what is more fun than a book that is also a toy? Bouncy Bible Buddies are fun, interactive, engaging stories from the Bible written for kids 3-6 years old. The easy grip handles turn these lovable animals into carry along friends. Push the handle down to make them bounce! This creative and fun design will draw little ones in time after time and help them learn more about God’s word and His love for them. Daniel in the Lion’s Den and The Lost Sheep are available now! There are many benefits to sharing these experiences with your children. You will build a stronger relationship as you spend time together, your child will learn to love God’s word, and who knows – you might even learn a few things yourself. Want to win some adorable Bible Buddies for yourself? Enter using the Rafflecopter below. Each winner will receive BOTH Daniel in the Lion’s Den and The Lost Sheep! For most people, it seems like it’s the second child who is THAT kid. The wild one, the one for whom you have to create the rules, the one who is causing you to run wildly all over the place while your friends sit and sip coffee and their obedient children give you the side-eye. For me, it wasn’t. My second child was an awful baby. He was lactose intolerant, wanted to be held nonstop, and didn’t sleep through the night until he was 15 months. But then he became the easiest toddler in the world. At 4 1/2, he is still quiet, focused, brilliant, and altogether pretty easy to parent. But then we had a third. And my Joshua is THAT kid. I’m pretty sure Joshua exited the womb with a sneaky grin on his face. He has always been giggly and finds everything hilarious. At 2, he makes silly voices and tries to trick Mommy and Daddy by hiding behind doors. It’s not all fun and games, of course. He also runs away in parking lots, refuses to obey any and all rules, swings from stair rails, and I live in fear that he will break all his bones or bust his head open on a daily basis. So what do you do when your kid is THAT kid? When people give you funny looks because you’re nonchalantly watching at your child runs laps in a public place or dives from chairs onto your lap 36 times or is singing loudly at the grocery store? You take deep breaths. You try to keep him safe while letting him have free reign and make his own mistakes. You remember that he belongs to God and not to you. You make peace with the fact that most parents see the inside of the ER with their child. You figure out what is a big deal and what is not. And you pray. And pray and pray and PRAY. Most of all, you try not to worry about what other people think. It’s what God thinks that matters. So others may think I need to discipline more/less, structure more/less, school him, unschool him, go back to work, work less … but I have to keep my mind on what God has for him and our family. I pray that one day my sweet Joshua will aim that joy to rejoicing in Jesus. Before I had my son, I knew nothing about children. I never had siblings or cousins to “practice” on and babysitting wasn’t my thing. So the first time I walked into the big baby warehouse with my husband I was floored! Who knew babies needed so much stuff? Well, I’ve since found out that children don’t need much. Diapers, clothes, a lot of love, and — if you don’t have empty boxes and plastic containers around — a few toys will keep them occupied for hours. Picking out toys for our children, though, can be quite cumbersome. If you frequent one of the big toy warehouses you may know all too well the temptation to buy every single toy in the store. Even trips to the consignment sale and discount store can tempt you into buying more than needed, because the toys are such a good deal! Toys are tricky. As parents, we want to provide our children with every opportunity to learn, but we don’t want to overwhelm them with so many choices that they don’t even know where to begin. I’ve decided to be quite choosy with the toys my son has at home. The toybox isn’t overflowing, so we try to be very purposeful with the toys he has to play with. The goal is for each toy to help instill the Word of God in his heart and reinforce the principles and stories of the Bible. Instead of choosing a cartoon coloring book, I’ll choose one with a Bible story theme. Instead of letting him watch cartoons on TV, I’d rather he watch something like VeggieTales. When he’s learning shapes, we’ll choose the toy pictured here most often so he can hear the story of Noah’s ark. Being choosy with toys won’t necessarily ensure that our children will grow up to love God with all their heart, soul and strength. But I want to utilize every opportunity to teach my son (and future children) about God and His Word. I want to live out Deuteronomy 6:5-9 and literally repeat His Word to my children, talk about it when we sit in our house, walk along the road, when we lie down, and when we get up. Christine Satterfield loves Jesus, her family, and the church. She spends as much time as possible playing with her son, and she’s constantly cleaning his toys. You can find out how she cleans them on her blog iDreamofClean as well as learn other household cleaning tips and tricks for the busy mom. Originally published October 10, 2010. Can we have a show of hands for those with children starting kindergarten this year? Ah yes, there you are, the mom or dad with the shaking hands and nervous twitch. I am there beside you, feeling lost and afraid and just a tiny bit ecstatic. Whether you have just a few weeks or a few years left to prepare, there are ways to help your child (and yourself!) be ready for that first day of the Big K.
Read, read, read! 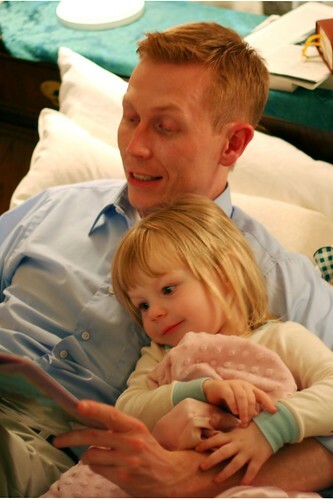 Reading to your child is one of the best ways to prepare for school according to kindergarten teachers (source). As you get closer to actually starting school, books dealing with the topic of school might he helpful. Some your child might enjoy: Peppa Pig and the Busy Day at School, I Am Too Absolutely Small for School, Kindergarten Here I Come!, and Miss Bindergarten Gets Ready for Kindergarten. Don’t Ignore It. Talk about going to school, what the schedule will be like, tour the school, go to orientations. Ignoring the fact that your child is getting older won’t make it go away! Consider Delay. If your child’s birthday is close to the cut-off, consider waiting a year. Teachers say that parents may regret sending a child who isn’t ready to school. Communicate. Talk to other parents, teachers, administration. Familiarize yourself with the kindergarten process if it’s your first year as an elementary-school parent. Calming your own nerves will make it easier for your child. Any tips from parents more experienced than I? “Daddy, can we do the questions?” That request is music to my ears. Shortly after our son, Joshua, turned 5, my wife and I began teaching him a catechism, which is a series of questions and answers designed to explain basic biblical doctrine. We began asking Joshua a new question every second or third day as part of the prayer and snuggle time we have with him and his 2-year-old sister. Several things amazed us right away. Joshua was able to answer many of the new questions correctly with little or no help. It is encouraging to see that what we talk about at home and what he hears at church are anchoring firmly in his mind and heart. He was able to quickly and easily learn new questions. Children have an amazing capacity to absorb information. We want to pour the gospel into our children as much as possible to take advantage of this developmental stage. He was eager to “do the questions.” Showing a little encouragement and excitement when he answers questions correctly goes a long way and is helping him have fun as he learns about God. The catechism questions began fueling wonderful spiritual conversations about God, life, heaven, and his unchurched friends. Initiating spiritual conversations has become easier and more natural. Our biggest surprise was that our daughter, Hannah, was learning almost as much as Joshua! Our hearts quickly began to melt when we heard our 2-year-old’s sweet voice articulating biblical truth. It reinforces the principle that you can’t start this process too early. As a parent, you know that summer is a mixed blessing of free time for your child. Why not invest some of that time into teaching your child a catechism or challenging your child to learn a Bible verse each week until school starts? Or do both and learn a verse with each question. Sweeten the challenge by offering a quality reward at the end of the summer if he succeeds. (God mentions rewards quite often in the Bible; there is nothing wrong with motivating a child similarly!) Let this summer be a life-changing summer for your child. Perhaps you will experience the same change as well! A. By loving Him and doing what He says. Q. Why should you glorify God? A. Because He loves me and takes care of me. Find a church with Saturday evening services and attend a few during the summer. Attending a different church’s worship service may further energize your family’s walk with Christ. Find different ministry opportunities in which to participate as a family (soup kitchens, clothes closets, etc). Make it a goal to invite a friend to church each Sunday during the summer. Encourage your child to keep a prayer journal during the summer. Brian Dembowczyk is Associate Pastor of Discipleship and Assimilation at FBC Tampa, Florida. He is married to Tara and is father of Joshua (5) and Hannah (3). You can follow Brian on Twitter at @BrianDembo or check out his blog at missionaldiscipleship.blogspot.com. Q: My husband is very anxious about the birth of our second child. He is feeling the economic pressure of our expanding family and worries about everything. He is making me anxious because of his state of distress. What can I tell him to calm him down? I know God will provide if we are faithful. A: You are so right. God is faithful and promises to provide for our needs. Maybe this study published in Pediatrics will help him realize he needs to trust and let go of worry. The study included 32,000 children and found that the psychological distress of Dad during pregnancy did impact child development. Specifically, fathers were given a screening questionnaire regarding their mental health status during their partner’s pregnancy. Later, mothers were asked to also fill out questionnaires regarding their child’s development. Controlling for a number of variables, a link was found between the fathers’ mental health and their children’s later developmental problems. Dads who scored high on anxiety and distress when the mom was 17 to 18 weeks pregnant had children who were more disruptive and anxious at age 3! We don’t know exactly why this is, but maybe the mental health of the father later impacts his parenting, or maybe his mental health impacts the mother’s mental health, or maybe there is a genetic link. The point here is that the mental health of the dad, not just the mother, impacts the developing child. So let your husband know that his anxiety and distress could be affecting your child. It is time to trust God to meet your needs and let go of worry. Your new baby is too important and you want to give him or her the best start possible. Dr. Linda Mintle is a licensed therapist and an Assistant Professor of Clinical Pediatrics. She is a national speaker and bestselling author with 18 book titles currently published. Visit her website at drlindahelps.com. Having a baby or bringing a child home soon and want to share the news with the world? I love birth announcements – tiny pictures, sweet cheeks, happy news. If you’re looking for one that share Scripture or scriptural truth as well, we’ve got some choices for you! This beautiful one-photo design has Psalm 139:14 – “I praise you for I am fearfully and wonderfully made …” You can find it at Photo Card Cafe, and there’s also a blue version. Another favorite verse for parents of newborns is “For this child I prayed” (1 Sam. 1:27). Here’s a lovely black-and-white card with hints of blue or pink. I love that the Scripture on this one is a little different from what you normally see. It says, “With my mouth will I make known Your faithfulness to all generations” (Ps. 89:1). And isn’t announcing the birth of a child or an addition to your family just that? The Blessed Family birth announcement comes to you via a digital file, so you can have it printed wherever you want. There is a choice of pink, lavender, green, and blue backgrounds. This announcement has a poem, with the words to the poem in one color and font and the announcement information in another color and font. A little more formal. This one is also a digital file purchase.